Can dogs eat watermelon? 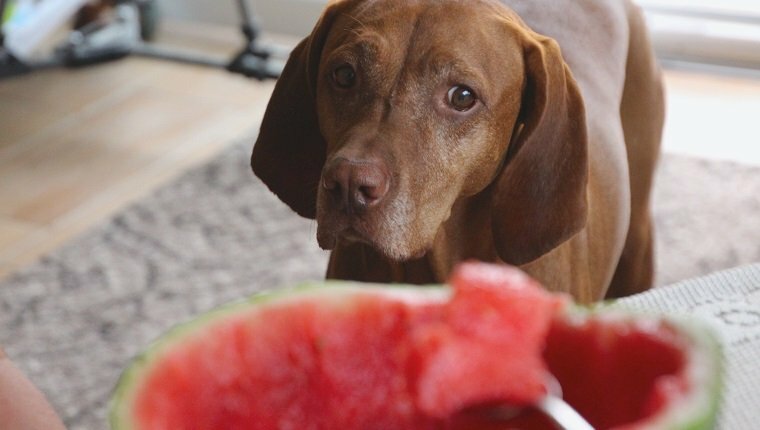 The short answer is yes, dogs can eat watermelon, but before you feed your dog this tasty fruit, there are some things you should know. 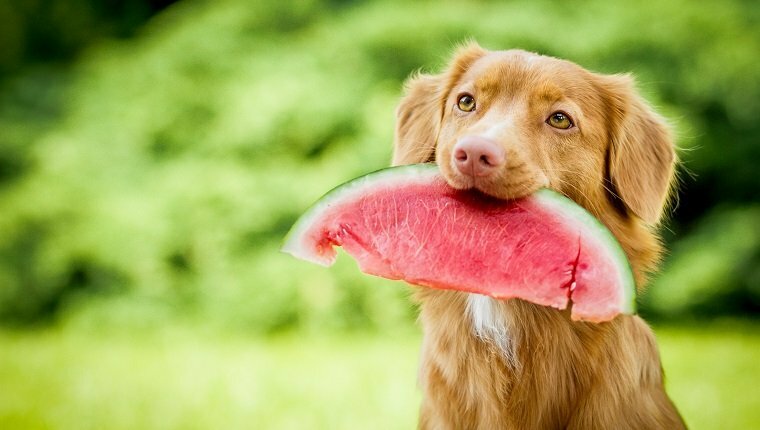 Watermelon has plenty of vitamins and nutrients that are beneficial for your dog’s health, and they’re made of 92 percent water, so they can be especially refreshing on a hot day. However, too much of a good thing can be a bad thing, and the rinds and seeds of watermelons can cause serious health problems. 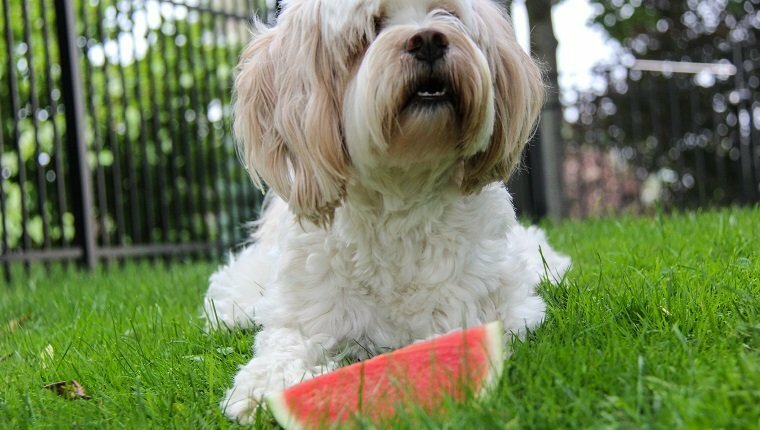 It is important to know how to serve watermelon to your dog safely so they don’t get sick. Here is what you should know about feeding watermelon to dogs. How Is Watermelon Good For Dogs? Watermelon is full of beneficial nutrients that are healthy for dogs, including potassium and vitamins A, B6, and C. It is also high in fiber, which is good for digestion. Although watermelon contains sugar, the fiber content in the fruit insulates the sugar and prevents it from being released into the bloodstream too quickly. Watermelon is also a source of lycopene, which is an antioxidant that may help prevent cancer. Watermelon is low in calories, low in sodium, fat free, and cholesterol free, which makes it a healthier choice than many store-bought treats. Being made of about 92 percent water, this fruit can be a good source of hydration and an especially refreshing treat on a hot day. When Is Watermelon Bad For Dogs? Watermelon isn’t meant to make up a large part of a dog’s diet. Dogs who eat too much watermelon will probably get a tummy ache along with some diarrhea or other signs of gastrointestinal upset. Some dogs get an upset stomach when they try a new food that they aren’t used to. It is best to give your dog watermelon in moderation, especially if they haven’t eaten it before, and see how they react. You can ask your veterinarian or nutritionist about the appropriate amount for your individual dog. The seeds can pose a problem for dogs. One or two seeds might not make much of a difference, but many seeds can end up causing a blockage in the digestive tract. Some large dogs may be able to pass the seeds without problems, but smaller dogs are especially at risk for a blockage. The rinds are also not safe to eat. Though dogs may safely nibble at the light green insides of the fruit, this part of the watermelon is firm and difficult to chew. Dogs may swallow the rind without completely chewing it, which can result in intestinal blockage. The skin of the watermelon is also very difficult to digest and can cause further blockage. Again, smaller dogs are more at risk. If your dog does eat the seeds or rind of a watermelon and you see the signs of an intestinal blockage, including vomiting, constipation, lethargy, and abdominal pain, get to your veterinarian right away to avoid serious complications. You should be on the lookout for signs of intestinal blockage for at least 24 hours after your dog eats the rind or seeds. Sweet products that contain watermelon or anything that is artificially watermelon flavored are probably not a good idea for dogs. They are usually full of sugar, chemicals, or other substances that can make your dog sick. Too much sugar can lead to gastrointestinal upset in the short term and diabetes or obesity in the long term. Artificial sweeteners such as xylitol can even be toxic to dogs, so stick to plain watermelon that you prepare, yourself. That way you know what’s in it. 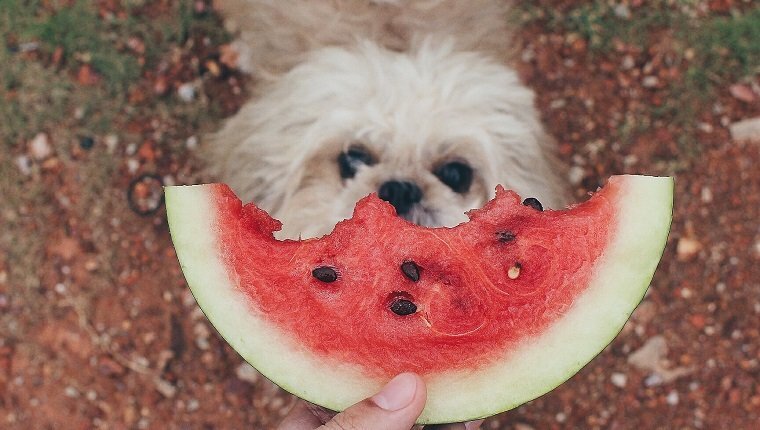 How Should You Feed Your Dog Watermelon? Before you feed your dog watermelon or any other human food, you should ask your veterinarian or nutritionist about how much you should feed your dog, if any, and how often. Many dogs have different dietary needs, and some have medical conditions that might make watermelon a bad choice. Once you have the okay from your vet or nutritionist, make sure you remove any seeds or rind from the watermelon before giving it to your dog. Cutting them up into small, chewable cubes is the simplest way to prepare watermelon for dogs and makes for a nice, easy treat. You can also freeze watermelon to make an extra refreshing summer treat, but make sure your dog’s teeth are healthy enough to chew frozen food without being damaged. If you’re feeling extra creative, you can mix watermelon with other safe and healthy ingredients like blueberries to make a fruit salad or smoothie for your dog. Follow any safety tips your veterinarian gives you for feeding your dog safely. Have you ever fed your dog watermelon? Do you have any recipes for watermelon dog treats? Let us know in the comments below!